HC Supplies stock an amazing assortment of splashbacks in a variety of colours, materials and styles. Our quality back splash products are an absolute steal, with all recommended retail prices slashed to make designer living affordable for all. Take your pick from exceptional big brand names in our kitchen back splash range, including Axiom, WilsonArt, Omega, and Corian. With so many kitchen backsplash options, you may not know where to start, so why not give our friendly customer services advisers a call for more information about our entire splashbacks range? Browse all our kitchen splashbacks today. Whether you are looking for luxury walnut block splashbacks, grey slate kitchen splashbacks, or glitterstone splashbacks, you will find the perfect kitchen wall splashbacks in our exclusive kitchen splashbacks UK collection. Our splashbacks UK range has been created to cater for the styles our customers want at affordable prices. Enjoy over 50% off many of our kitchen worktops and splashbacks, including the Pro-Top Galaxy granite glitter gloss black splashbacks, and the white glitter gloss splashbacks. We offer huge savings on every single one of our kitchen worktop splashbacks, so why not take a closer look at all our bargains? We know how important it is to purchase splashbacks and upstands that are specifically designed to withstand the daily challenges of the modern kitchen. Kitchen splashbacks and upstands need to be easy to clean, stain resistant, and most importantly, able to deal with hot liquids. Of course you will want your splashbacks kitchen design to be appealing, and when you pruchase splashbacks options and accessories from HC Supplies, you won't need to compromise on stunning designs in order to ensure the efficacy of your chosen kitchen splashbacks and upstands. Our UK splashbacks range comprises carefully selected worktop splashbacks from high end manufacturers, renowned for the quality of their worktops and splashbacks. HC Supplies customers know they can rely on us to provide outstanding products and a fantastic service when purchasing their UK splashbacks from our user-friendly website. We understand it may be difficult to know what type of splashbacks will be best suited to your kitchen, which is why our advisers wil be delighted to help you in any way they are able. 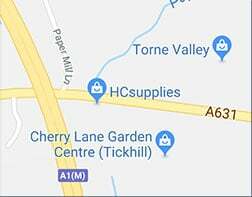 Should you want a closer look at any of our products, including kitchen splashbacks, why not take a trip to our Doncaster showroom? Here, you can find inspirational ideas for your kitchen, and can also talk to our friendly customer service staff about your requirements. Our experts can advise you regarding materials, size, and style, and can also assist with the design of your kitchen. Home owners living within 30 miles of our Doncaster showroom are invited to take advantage of our impressive design services which are available at extremely affordable prices. Make things so much easier by allowing our professional design team to make the most of your kitchen, and transform the heart of your home into something truly special. We can assist as little, or as much as you need so why not pop in an discover exactly what we can do for you? If you prefer to do all your browsing online, find out more about each of our kitchen splashbacks by clicking on the relevant link. One of the biggest concerns of consumers purchasing products online is that their items will not arrive on time or in perfect condition. HC Supplies' customers however know they can rely on our experienced drivers to deliver all splashbacks promptly and carefully. Each of our drivers has been meticulously screened, and we only employ the most professional driving teams to transport our splashbacks to your home. Once you have chosen your perfect splashbacks, you can expect them to arrive within 2 to 7 working days. Do you need them to be delivered on a specific day? No problem - we can arrange for your splashbacks to arrive on a date to suit you. Contact our customer services team via 'phone, or alternatively, complete the online contact form and one of our team will respond as soon as possible. Are you a homeowner with properties abroad? It is not only UK residents that can take advantage of our fantastic deals, and we are delighted to be able to ship all our products, including kitchen splashbacks, to properties abroad. Overseas delivery of your splashbacks is easy - just give our customer services a call after purchase, and we will organise everything to ensure your items arrive at the required address. Discuss delivery and pricing options with our dedicated advisers today, and find out just how little it can cost to rejuvenate your kitchen. Update your home without blowing your budget by buying designer splashbacks online at HC Supplies.